Can't Braid? Try A Two-Strand Twist. Confession: My braiding skills leave a lot to be desired. I’ve tried everything out there that might even come close to the plaited style. And, sadly, a lot of those attempts just involved becoming friends with expert braiders who were kind enough to do my hair for me. At least, that was until I met the two-strand twist. This hairstyle is not new. While the natural-hair community has been relying on it for ages, the styling trick's been a well-kept secret. Well, here's the secret: These twists aren't just for looks. They also make for a great protective style by locking in moisture while preventing breakage and split ends. Since we're all about making styles as easy to try as possible, here's an introductory lesson. Picture Solange. Now, spin all your hair into twists slightly smaller than hers and just head to sleep while the style takes hold. (Styling while you sleep? We know, it's the best.) Next, unfurl your strands and enjoy a twist-out — a totally different curl pattern than your natural look, achieved without any heat tools (or heartache). As a reference, singer-songwriter Corinne Bailey Rae is one of the most visible celebrities known to rock this style. Her hair often has the tons of volume and loosened waves typical of the twist-out technique. Another secret of the twisty 'do? It can work for any hair type. In wavy hair, it will add volume, but it will also over-power your curls leaving more of a finger-wave texture. Which means you'll need lots of hairspray for hold. For the straight-hair-sufferer known to moan "My hair never stays curled!" — this will work for you, too. Expect light, beachy waves from the two-strand twists, and a jolt of volume when you release for the twist-out. As you probably assume, ample hairspray is recommended. Now that you're convinced to give it a try, click ahead to master this couldn't-be-easier style. The two-strand twist doesn’t have to be used only as a protective style, nor are you somehow required to twist up your whole head of hair. For starters, you can try a single twist to replace your staid braid. In fact, when done correctly, the twist can come out looking just like a braid with the double upside of being a lot easier — and less time-consuming — to do. Step 1: Pull out the section of your hair you want to put into the twist. The size here is totally up to you. A bigger strand will mean a bigger twist. Step 2: Starting at your roots, separate the original strand into two pieces (instead of three like you would for braiding). Hold one strand between your forefinger and thumb of each hand. Step 3: Pull the hair tightly and then pass one strand over the other, grasping it between your forefinger and middle finger of the hand with the strand you have yet to move. Step 4: Still holding hair tightly, move the second strand to your other hand, holding it between your forefinger and thumb. Move the original strand from between your middle finger and forefinger to between your forefinger and thumb. Step 5: Pass the second strand over the original and begin the process over again until you reach the end of the strands. Secure it in place as you would a braid. Holding the hair tight will keep the style neat by maintaining the twist throughout. If you want a messier look, just loosen up on your hold. Next up, master the twist-out. 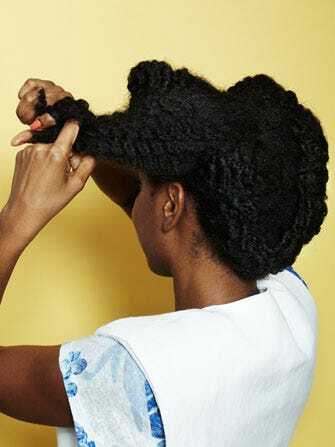 Putting all of your hair in multiple two-strand twists before bed and taking them out in the morning will give you loads of volume. And, it's so easy it's practically cheating. Step 1: Apply light-weight mousse to damp hair for hold and then section off your hair into four or more sections. Smaller sections will take longer to do, but will give you more volume and a more defined pattern. Step 2: Starting at the root, tightly begin to twist hair per the instructions above, one strand over the other keeping each strand tightly twisted. Step 3: When you get to the end, secure with a small rubber band or simply let go. If the twist is tight enough, it will hold. Step 4: Twist the other sections of your hair. Once finished, use a tee shirt or silk bonnet to wrap all of your hair while you sleep. Step 5: First thing in the morning, take out your twists and scrunch in an oil to loosen the pattern and tame any frizz. Rose or jojoba oil are good options. Step 6: Let your hair fall as you get ready and then hairspray before you head out. Finally, rake in the compliments from other hairstyling neophytes who'll be sure you just came from the salon.